Challenge: New technology allows companies to track consumer’s every move. However, caution must be taken to ensure that permission is gained before tracking commences. The percentage of consumers willing to share their current location via GPS with retailers nearly doubled year-over-year to 36 percent. 38 percent of consumers would provide their mobile number for the purpose of receiving text messages and 32 percent would share their social handles with retailers. This same sentiment has been confirmed in our Voice of Customer (VoC) research for Fortune brands regarding willingness to opt-in based on Reciprocity of Value expectations. Today’s customers are multichannel. Therefore marketers have to follow their lead. Macy’s PromoAlert program allows customers to opt-in to receive push marketing via email or text as well as through an Android or iPhone mobile app. Additionally the company allows customers to opt-in to receive information on specific events, bridal registries, and more. Macy’s has also begun testing Shopkick, an iBeacon/BLE-based Bluetooth signal at its Herald Square, New York and Union Square, San Francisco stores. The app automatically welcomes shoppers as they enter a store and shows location-specific deals, discounts, recommendations and rewards. The app can also tie in at-home browsing to an in-store benefit—if a shopper “likes” a specific product in the app. The Shopkick technology ties into the retailer’s own app. The company has established complete transparency in their opt-in mobile tracking technology. 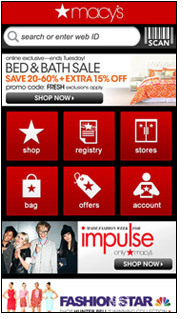 Macy’s offers details on their PromoAlert program on their web that allows customers to both sign-up or opt-out. It cannot be emphasized enough that transparency is essential in order to get active opt-in from customers. Retailers need to develop all tracking technologies in a way that preserves trust and delivers personalized benefits in exchange for their willingness to provide increasingly deeper levels of personal information. Improve customer loyalty through personalized brand experiences. Customers who opt in expect that the information they receive will dramatically enhance and improve their overall experience. Integrate digital and physical stores to enable a seamless shopping experience for customers. Every aspect of your marketing needs to reinforce your overall brand and customer experience. he results achieved by ERDM's VoC-based strategies earned Ernan Roman induction into the Marketing Hall of Fame.